One Man, Two Guvnors opened at London’s National Theatre in 2011. Written by Richard Bean and directed by Sir Nicholas Hytner it is a British adaption of The Servant of Two Masters by Carlo Goldoni (1743) and set in 1963 Brighton. 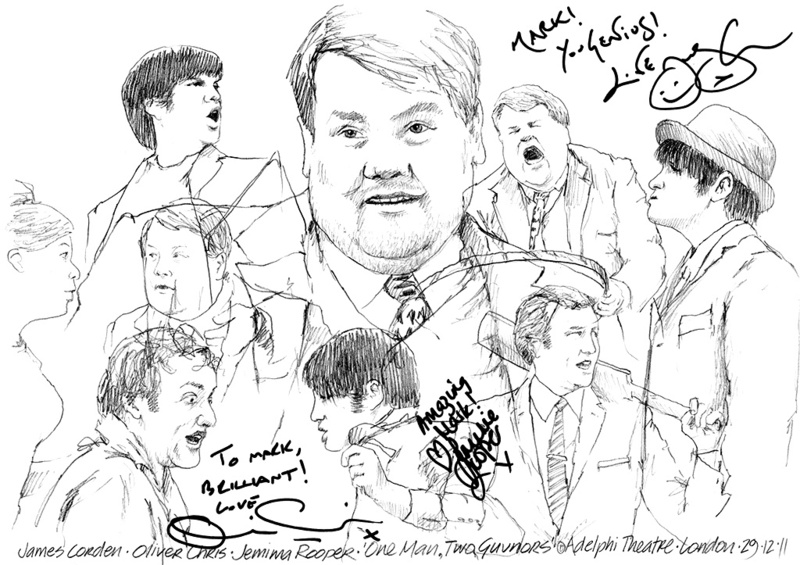 It transferred to the Adelphi Theatre in November 2011, where James Corden, Oliver Chris and Jemima Rooper signed my sketch. After closing in February 2012, it premiered on Broadway’s Great White Way at the Music Box Theatre until September. The play was nominated for seven Tony Awards, with James winning for Best Actor. This entry was posted in Celebrity, Theatre and tagged Adelphi Theatre, Autograph, Broadway, Drawing, James Corden, Jemima Rooper, Nicholas Hytner, Oliver Chris, One Man Two Guvnors, Richard Bean, Signature, sketch, the national theatre, Theatre, West End by Mark Winter / Chicane. Bookmark the permalink.